The Sofa Kings are the latest addition to this Battle of the Bands Sweet 16 edition of terrific bands. 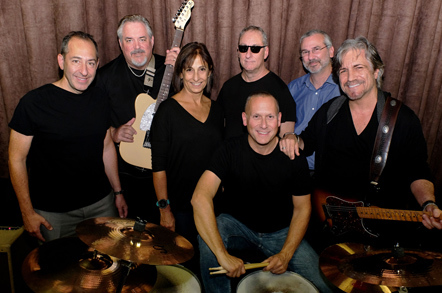 Made up of an eclectic group of musicians of diverse backgrounds, the band’s members all have one thing in common - a love of songs that are Sofa King great. The band has only been together in this incarnation for the last 6 months. A subset of this band has been playing together under the name Friends with Benefits Band for the last five years. After having attended the BoB to see their friends in other bands for all these years, this group decided it was time to put their collective energies together to form an ensemble that would be BoB-worthy; and to better stop procrastinating and do this before they ended up as in-patients at Maimonides, themselves. Dave Segal, formerly of Toronto (but originally from Montreal! ), is the latest addition to the Sofa Kings. He cut his lead guitar teeth playing for over twenty years in a celebrated Beatles tribute band called the Rattles. His deep love of the blues has offered him unique opportunities to jam in Chicago with Buddy Guy, while also and forever.... chasing Clapton’s blissful “woman tone” while with The Bluesbreakers. Harris Caplan, is no stranger to BoB, having played Bass previously with the band UB over 40. By day, Harris certifies airplane designs and at night, he hangs up his rule books and helps drive the rhythm. For the last 18 months, he has been the driving Sofa King bassist. With an attention to detail and harmonies, he is as much appreciated by his bandmates, as he is by his day-job employers where he helps the planes fly straight and level. Our female vocalist, Selina Itzkowitz, when not trying out new numbers in front of her dog, has been the administrative director of the Centre de la petite enfance du Centre Communautaire Juif for the last 20 years. Her love of harmony is most evident when she is caught harmonizing out loud to music leaking out of stranger's earbud headphones. Mike Rich who hails from Daytona Beach is an amazing rhythm guitarist who played professional guitar and was a recording studio engineer in the Florida music scene for twenty years. His road stories keep the rest of his new band-mates most entertained - we are lucky when we get to rehearse a song between stories. When not distracting us with tales of his colourful past, he is pushing for us to be the most calorically-challenged band with his wife Ilana's fabulous baked goods ("Creative Cakes by Ilana"). Jonathan Maldoff, is in the driver's seat of this band, both figuratively and literally as our drummer and chief operating officer. From securing rehearsal space (thanks to Prime-Time Players 2.0! ), to arranging our chaotic schedules, to event bookings, Jonathan is the man. When not running his company (Intellera) that does business process engineering to help companies run more profitably, he is either taking care of his three daughters and his dog, Cody (who is in a shared-custody arrangement, but its not what you are thinking...better not to ask), or ruminating on how to improve the band. Jonathan feels especially close to this event as both of his parents have received outstanding care at Donald Berman Jewish Eldercare. Bill Goldig, our lead male vocalist, has been attending battle of the bands for many years, admiring his wife Terri, lead singer of Switchback. The Battle of the Bands takes on entirely new meaning as both Bill and his wife Terri will appear with their respective bands this year. When not selling chemicals across North America (he's a chemical salesman! ), he is coaching senior men’s soccer, and thinking about great tunes to sing. Benjamin Burko is better known for either having a video camera or a stethoscope in his hand, than an 88-key keyboard. His keen interest in live bands arose from studying wedding-band keyboardists in a career as a wedding videographer that spanned 20 years. His only musical experience was over 30 years ago as the director and arranger of an acapella group called the McGill MedMen. After numerous appearances on the Telethon of Stars, winning the CFCF Aaron Rand Show Theme Song Contest, and lending his voice to some Radio Jingles (the Original Moe’s Deli and Bar), he left his musical career for the glamour of baby spit-up and diaper rashes as the director of Tiny Tots Medical Centre. Quebec’s draconian health-care laws gave Benjy ample free-time to re-explore his musical-self. As the newest musician on the musical scene he is thankful to his bandmates for not having kicked him out of the band yet.